Most of the time when we speak about fashion’s exposure to China, we are faced with “we have moved away from “Made in China”” to “the brands we have invested in tell me they have moved their production outside of China”. Then when we probe a little further … what about raw materials? The answers from investors become a little less certain. We scoured the CSR/annual reports of top leading brands in sustainability which we wrote about last month here and here and found very little information about their raw material exposure. So we did our own deep dive…. 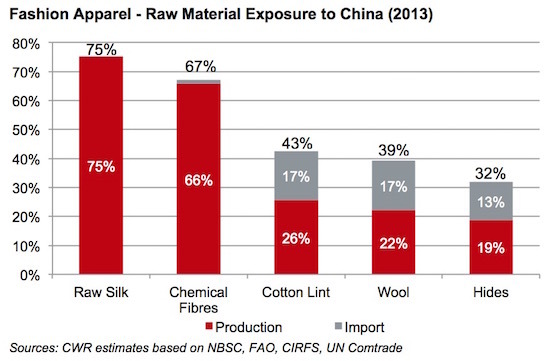 It is not just cotton, other fashion materials also have a high exposure to China. As shown in the chart below, China exposure as a % of global production ranges from a low of 32% of global hide production to a high of 75% of global raw silk production. Although it is unclear exactly where our clothes, shoes and handbags can be traced back to, we can say 67% of chemical fibre, 43% of cotton lint, 39% of wool and 32% of hides that went into making them was either produced or passed through China as imports. The materials shown in the chart below are commodities – at these levels ANY domestic movements caused by regulatory or physical (droughts) shifts by China as alluded to by the recent HSBC report “No Water, More Trade-offs” will affect the prices of these globally. 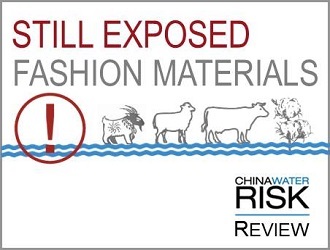 Whether one is making anything in China becomes irrelevant – the entire apparel & footwear sector is exposed to water risks (be they regulatory, physical, pollution, reputational or economic) in China. The drought in 2010/2011 caused fashion to shift to a year of rayon and nylon as cotton prices soared as the crop suffered. Synthetic prices also rose as a result and brands saw a significant downside to their real P&L (more here). 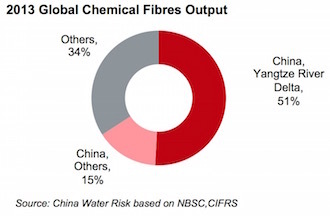 HSBC warns that managing water in China may result in shifts in cotton output but at 66% of global chemical fibre production, swapping out of cotton is not going to help reduce exposure to China. 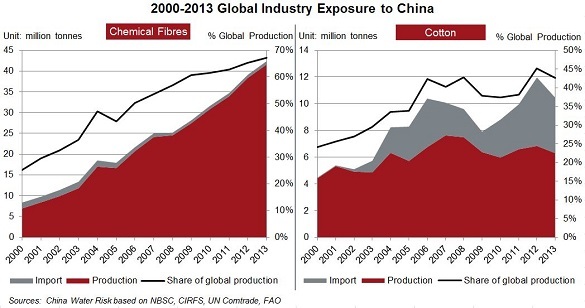 But has the trend of sourcing cotton and chemical fibres been falling? Has China lost market share in recent years? A closer look at these substitutes’ historical trends in China revealed the contrary – China exposure has been rising – for both cotton and synthetics. Synthetics, unaffected by weather, enjoys a smoother rise than cotton with 2 blips thanks to droughts. The Water Ten Plan released in May this year adds another layer of complexity to navigating China exposure. The Water Ten Plan wants businesses/factories to comply with the new industrial standards or shut down within the next 3 years. In the Yangtze River Delta, factories have a tighter deadline – more detail on this here. We highlighted that textiles was the most targeted sector in an earlier review of the plan but a glance at the map below shows just how dire this is – 77% of chemical fibres are produced in the Yangtze River Delta. That is a shockingly high level of chemical fibres production facing “comply or else” by 2016/2017. As if this is not bad enough, 86% of chemical fibres in China are produced in water scarce and water stressed regions in China. Either way you look at it, be it water scarcity or water pollution, the sector will be impacted. 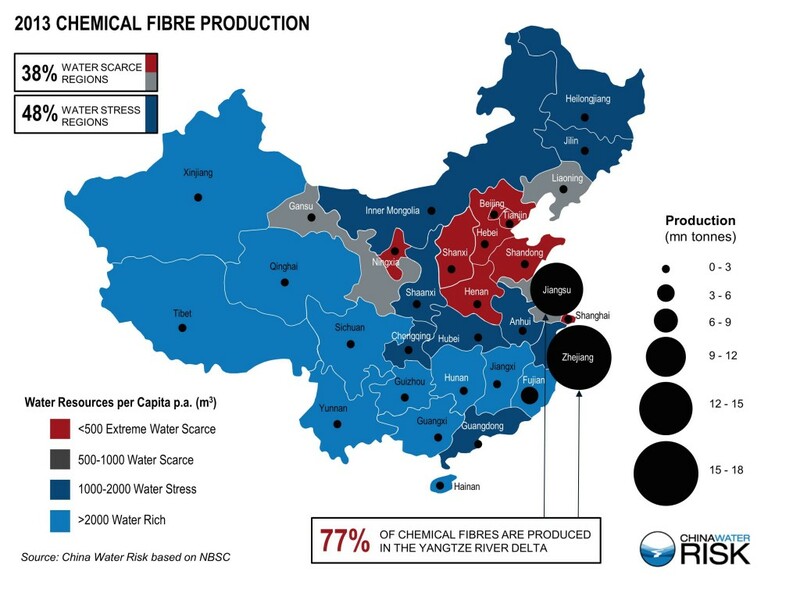 In case you are still not convinced, this means that over half the global chemical fibre output is subject to China’s Water Ten Plan. Moving cutting and sewing outside of China is not going to mitigate this level of exposure. … or should OEMs take collective action & demand higher prices? Setting up factories outside of China with more relaxed regulations so that the industry can continue to not pay for pollution and sell cheap clothes could be a way out for fashion brands but can this amount of production be moved within 2 years? We doubt it. In fact recent conversations with manufacturers/ industry associations in China point to “highly unlikely”. Surely it is time for serious “collective action” by brands to work with Chinese manufacturers to help them meet the new regulations? Otherwise, left on their own & faced with tough regulations, the currently fragmented chemical fibre producers in the Yangtze River Delta may look to “collective action” on their own to ensure their survival. With 51% of the global market, price setting power for synthetics will thus inevitably shift from brands to OEMs. Imagine what that would do to the fashion industry. So surely a better way forward for brands would be to work with China to improve wastewater treatment in the sector and push for ways to go circular. We note that H&M Conscious Foundation has recently announced a €1 million grant to pioneering ideas closing the loop for fashion. We applaud this initiative – it is definitely a step in the right direction. But it remains to be seen how serious brands are at scaling up these innovations. This grant compared to the US$1.7 trillion fashion industry is still a mere scratch. Given the sky high exposure to China from 43% in cotton to 67% in chemical fibres (which together accounted for over 93% of global textiles produced in 2014 according to the recently published GLASA report), can brands afford to look the other way? The impact on the entire fashion industry’s bottom line is clearly material. In fact, “material” would be an understatement. These levels demand a paradigm shift – from linear to circular. Are consumers willing to pay more? Chinese consumers apparently are according to a recent Chinese study. Perhaps this could be helped along with the millions of advertising dollars spent by the fashion industry directed towards “sustainable” lasting fashion instead of towards “throw-away” fashion. Or perhaps the right question here is not what brands can gain in promoting circular innovations but what will happen to them if they don’t? Do not follow the path of Eastman Kodak who did not seriously commit to innovations outside of film to embrace a digital future thereby resulting in bankruptcy. The future is circular in textiles and going circular is what China wants; and China is home to a vast amount of key fashion materials. Something has to give – someone has to pay for pollution – moving to Africa to pollute there in order to maintain profitability cannot be the solution. Maybe it is time to accept the reality of more expensive clothes. A serious rethink of some of the existing business models within the fashion industry is in order. Where Are The Top Fashion Brands? – Given tighter regulations for textiles in China, we review the environmental initiatives of 10 top fashion brands from fast fashion to luxury. Are they looking beyond CSR to make their business model sustainable? China’s Economy: Linear to Circular – China is the 3rd country globally to enact polices to move towards a circular economy. See how & why China needs to make this transition; which industries are affected, what is the role of industrial parks?